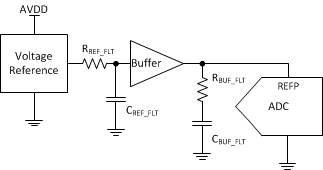 For better INL (±0.8 LSB max), DNL (±0.5 LSB max), an integrated voltage reference, voltage reference buffer, and VREF/2 for DC biasing see ADS8167. The ADS8331 is a low-power, 16-bit, 500-k samples-per-second (SPS) analog-to-digital converter (ADC) with a unipolar, 4-to-1 multiplexer (mux) input. The device includes a 16-bit capacitor-based successive approximation register (SAR) ADC with inherent sample and hold. The ADS8332 is based on the same core and includes a unipolar 8-to-1 input mux. Both devices offer a high-speed, wide-voltage serial interface and are capable of daisy-chain operation when multiple converters are used. These converters are available in 24-pin, 4 × 4 QFN and 24-pin TSSOP packages and are fully specified for operation over the industrial –40°C to 85°C temperature range.